Manisha is General Manager at Venture Center. 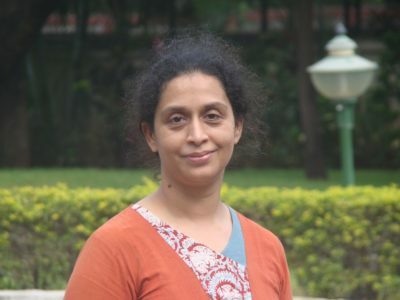 She is Ph.D ( Biotechnology), University of Pune; Post-doctoral training, University of Cambridge, UK. She has research experience in biotechnology, microbiology, fungal biotechnology, molecular biology and molecular virology. She has experience in planning and setting up of advanced scientific facilities and program management. Niranjan is Clinical Engineer at Deenanath Mangeshkar Hospital and Research Center, Pune. He is B.Tech (Instrumentation, College of Engineering Pune), M.Tech (Biomedical Engineering, IIT-B), Ph.D (University of Sheffield, UK). He is experienced in clinical engineering in areas of healthcare technology management, bio-impedance techniques and its applications, safety of medical equipment and medical devices. Premnath is Founding Director of Venture Center and Head, NCL Innovations. He is B.Tech (IIT-B), Ph.D (MIT, USA), Chevening Technology Enterprise Fellow (Centre for Scientific Enterprises, London Business School and Cambridge University, UK). He has experience in technology development and commercialization, working with start-up companies (in Cambridge-UK and India) and engaging with large corporations on research and consulting projects as project leader.